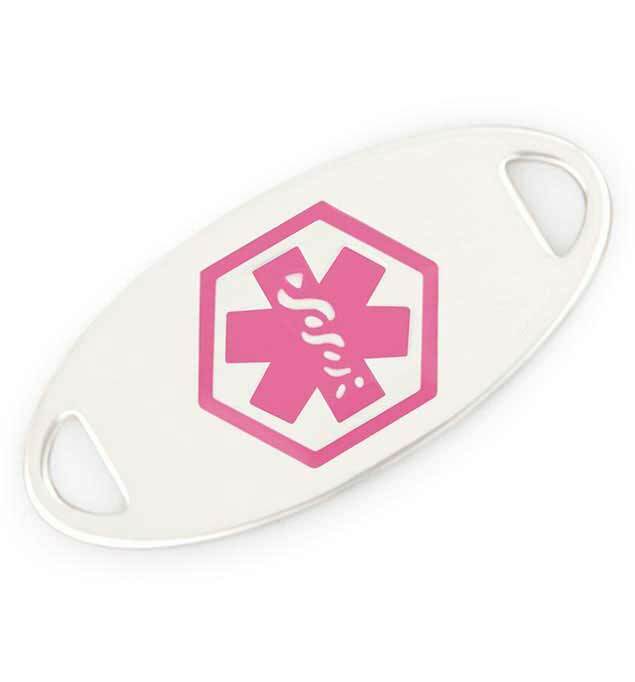 Our Stainless Pink Oval Medical ID Tag features a soft pink medical caduceus symbol on the front. This alerts first responders to your medical and emergency contact information, which we can engrave on the back using traditional tone-on-tone or color-filled laser engraving. Because this stainless steel medical alert tag is custom engravable, it is appropriate for any medical condition. Water-resistant and durable, the Pink Oval Medical ID Tag affixes easily to any interchangeable Lauren’s Hope medical alert bracelet strand using the lobster clasps at either end of the bracelet. When engraving your medical ID tag, we recommend listing your full name, chief medical condition(s), treatment considerations, any known food or drug allergies, and at least one emergency contact number, preceded by the letters ICE for, “In Case of Emergency.” Our medical alert tags are available with and without medical ID bracelet strands. So if you ever want a new look or need a different engraving, you can simply order a new medical ID tag and wear it with your existing interchangeable medical ID bracelet strands. Our stainless steel medical ID tags are appropriate for all conditions and come in a variety of colors and patterns. Whether you or your loved ones wear medical ID jewelry for a sulfa allergy, hypothyroidism, lymphedema, mitral valve prolapse, vision impairment, or for any other reason, you can select any medical alert bracelet and tag combination you like. We will custom engrave it to suit your needs and size it just right. All of our medical alert tags are water-safe and compatible with our interchangeable medical ID bracelet strands.